A siege tower or breaching tower (or in the Middle Ages, a belfry) is a specialized siege engine, constructed to protect assailants and ladders while approaching the defensive walls of a fortification. The tower was often rectangular with four wheels with its height roughly equal to that of the wall or sometimes higher to allow archers to stand on top of the tower and shoot arrows into the fortification. Because the towers were wooden and thus flammable, they had to have some non-flammable covering of iron or fresh animal skins. Used since the 11th century BC by the Babylonians and Assyrians in the ancient Near East, the 4th century BC in Europe and also in antiquity in the Far East, siege towers were of unwieldy dimensions and, like trebuchets, were therefore mostly constructed on site of the siege. 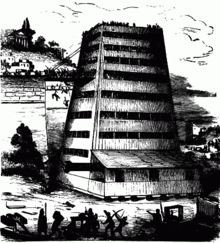 Taking considerable time to construct, siege towers were mainly built if the defense of the opposing fortification could not be overcome by ladder assault ("escalade"), by mining or by breaking walls or gates. The siege tower sometimes housed spearmen, pikemen, swordsmen, archers or crossbowmen who shot arrows and quarrels at the defenders. Because of the size of the tower it would often be the first target of large stone catapults but it had its own projectiles with which to retaliate. Siege towers were used to get troops over an enemy curtain wall. When a siege tower was near a wall, it would drop a gangplank between it and the wall. Troops could then rush onto the walls and into the castle or city. Assyrian attack on a town with archers and a wheeled battering ram; Assyrian Relief, North-West Palace of Nimrud (room B, panel 18); 865–860 BC. The remains of the Roman siege-ramp at Masada. The oldest known siege towers were used by the armies of the Neo-Assyrian Empire in the 9th century BC, under Ashurnasirpal II (r. 884 BC – 859 BC). Reliefs from his reign, and subsequent reigns, depict siege towers in use with a number of other siege works, including ramps and battering rams. Centuries after they were employed in Assyria, the use of the siege tower spread throughout the Mediterranean. The biggest siege towers of antiquity, such as the Helepolis (meaning "The Taker of Cities") of the siege of Rhodes in 305 BC, could be as high as 135 feet and as wide as 67.5 feet. Such large engines would require a rack and pinion to be moved effectively. It was manned by 200 soldiers and was divided into nine stories; the different levels housed various types of catapults and ballistae. Subsequent siege towers down through the centuries often had similar engines. But this huge tower was defeated by the defenders by flooding the ground in front of the wall, creating a moat that caused the tower to get bogged in the mud. The siege of Rhodes illustrates the important point that the larger siege towers needed level ground. Many castles and hill-top towns and forts were virtually invulnerable to siege tower attack simply due to topography. Smaller siege towers might be used on top of siege-mounds, made of earth, rubble and timber mounds in order to overtop a defensive wall. The remains of such a siege-ramp at Masada, for example, has survived almost 2,000 years and can still be seen today. On the other hand, almost all the largest cities were on large rivers, or the coast, and so did have part of their circuit wall vulnerable to these towers. Furthermore, the tower for such a target might be prefabricated elsewhere and brought dismantled to the target city by water. In some rare circumstances, such towers were mounted on ships to assault the coastal wall of a city: at the siege of Cyzicus during the Third Mithridatic War, for example, towers were used in conjunction with more conventional siege weapons. And in the section from the Polyandrion Gate as far as the Gate of St Romanus he prepared to station twelve lofty siege towers, which were advanced almost as far as the outworks, and he covered them with hides. At this siege the attackers also made use of "sows" – mobile armoured shelters which were used throughout the medieval period, and allowed workers to fill in moats with protection from the defenders (thus levelling the ground for the siege towers to be moved to the walls). However, the construction of a sloping talus at the base of a castle wall (as was common in Crusader fortification) could have reduced the effectiveness of this tactic to an extent. Siege towers also became more elaborate during the medieval period; at the Siege of Kenilworth Castle in 1266, for example, 200 archers and 11 catapults operated from a single tower. Even then, the siege lasted almost a year, making it the longest siege in all of English history. They were not invulnerable either, as during the Fall of Constantinople in 1453, Ottoman siege towers were sprayed by the defenders with Greek fire. Siege towers became vulnerable and obsolete with the development of large cannon. They had only ever existed to get assaulting troops over high walls and towers and large cannon also made high walls obsolete as fortification took a new direction. However, later constructions known as battery-towers took on a similar role in the gunpowder age; like siege-towers, these were built out of wood on-site for mounting siege artillery. One of these was built by the Russian military engineer Ivan Vyrodkov during the siege of Kazan in 1552 (as part of the Russo-Kazan Wars), and could hold ten large-calibre cannon and 50 lighter cannons. On 1 March 2007, police officers entered Ungdomshuset in Copenhagen, Denmark by being lifted to the upper levels of an illegally occupied structure using small boom cranes for a purpose similar to that for which siege towers were constructed. The officers were placed in containers that crane operators raised and placed against the structure's windows, enabling the officers to gain access to the structure. ^ a b The Walls of Constantinople, AD 324–1453, Osprey Publishing, ISBN 1-84176-759-X. ^ Crusader Castles in the Holy Land 1192–1302, Osprey Publishing, ISBN 1-84176-827-8. This page was last edited on 20 March 2019, at 23:35 (UTC).